The 1st Cavalry Division, a major subordinate command of the US Third Mobile Armored Corps, is a 19, 000 soldier, heavy armored division stationed at Ft. Hood, TX. As one of the two "on-call" heavy contingency force divisions of the Army, the First Team has an on-order mission to deploy by sea, air or land to any part of the world on a short notice. The following narratives, divided in timeline eras of major operational missions, describes the threat environment, tactical conditions, evolution of equipment technology and the strategic methodology employed by one of its command units, the 1st Brigade Combat Team and its Subordinate Units, to contribute to the successful missions enhancement of the warring organization of the 1st Cavalry Division and the honors they achieved are summarized in the chapters that follow. The "IRONHORSE" Brigade is ready to deploy, fight and win anywhere in the world and everything we do must be focused on that mission. The war on terrorism that our great nation is now embarked on demands that we continue to train and prepare ourselves in all areas and be ready when our nation calls. We have the finest soldiers, the best equipment and training on the face of this earth and I have no doubt in our ultimate victory. We do our very best every day. This brigade must be trained and ready to deploy, fight and win anywhere in the world. The dangerous and demanding nature of our profession mandates no one goes into harm's way unprepared. To accomplish this, our discipline, training and equipment maintaining must be the best. Our care and development oc soldiers and their families must be the best. We must do what's right. We are always accountable for our actions. Enforcing the Army standard and maintaining our professional conduct is a requirement for all soldiers. It is imperative that we treat all others and ourselves with respect and dignity - no matter what race, religion, national origin, gender or military rank. This is the foundation of a successful fighting unit. We train, fight and win as a team. Our mission and our lives demand it. We must trust and depend on each other day and night, on duty and off. We must rely on our superiors and subordinates to do their jobs to standard and take care of each other. We will empower our subordinates with responsibilities and the authority and accountability that comes with carrying them out. Our soldiers expect no less. We will protect the force. This brigade exists because of the superb soldiers in it, and we will ensure everyone's safety and well-being. All soldiers are responsible and accountable for their own safety and the safety of those around them. 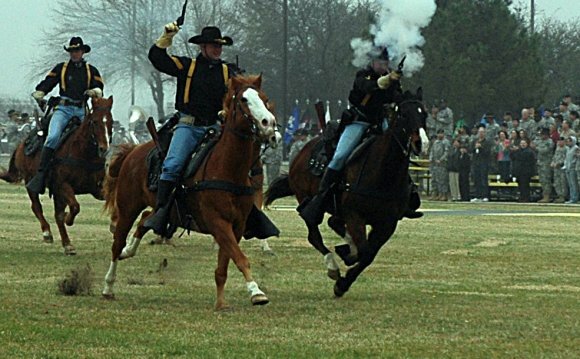 The 1st (IRONHORSE) Brigade was constituted 29 August 1917 in the Regular Army as Headquarters, 1st Cavalry Brigade. The following February the Brigade was stationed at Fort Sam Houston, Texas. The Brigade's initial wartime service was patrolling the Mexican Border, until demobilization, 14 July 1919, at Brownsville, Texas. Operating from horseback, the cavalry was the only force capable of piercing the harsh terrain of the desert to halt the band of smugglers that operated along the desolate Mexican border. The Brigade fought as Infantry in the Pacific Theater of World War II. It fought valiantly on New Guinea, the Bismarck Archipelago, and the Philippines, earning both the United States and the Philippines Presidential Unit Citation. The 1st Brigade Headquarters was converted and redesignated as Headquarters, 1st Constabulatory Brigade, on 20 May 1949, and served in Germany. The Brigade was relieved from assignment to the United States Constabulatory on 24 November 1950. On 15 August 1951, they deactivated in Germany and disbanded on 05 December 1951. The Brigade was again reconstituted in the Regular Army, converted, and redesignated on 15 July 1963, as Headquarters and Headquarters Company, 1st Brigade, 1st Cavalry Division. The 1st Brigade was transferred to Ft. Benning, Georgia, in July 1965 and deployed to Vietnam with the 1st Cavalry Division later that year. The Brigade was involved in many major operations including the Ia Drang Battle, the Pleiku Campaign, and the Cambodian Operation. The Brigade returned to Ft. Hood in July 1971. In June 1972, the brigade received the official designation of "IRONHORSE." The "IRONHORSE" Brigade deployed to Operation Desert Shield/Storm in October 1990 and conducted military operations with Allied Forces throughout the 6 month Gulf Campaign. The 1st Brigade redeployed to Fort Hood, Texas, in April 1991. Since 1991, elements of the Brigade have deployed to Guantanamo Bay for Operation Island Sentinel, to the Emirate of Kuwait for Operation Intrinsic Action, to the Republic of Korea for Exercise Foal Eagle, and the National Training Center at Fort Irwin, California for annual training. In April, 1998, the IRONHORSE Brigade was alerted for peace enforcement duty in Bosnia-Herzegovina as part of Stabilization Forces (SFOR) 4 on Operation Joint Forge. The IRONHORSE Brigade deployed to Bosnia from August 1998 until March 1999 and was crucial to maintaining peace and stability during a very critical and potentially violent time in Bosnia. Following an intense train-up period, including the first ever Low-intensity Conflict rotation at the National Training Center, the IRONHORSE troopers deployed in support of Operation IRAQI FREEDOM II in March 2004. There the IRONHORSE Brigade Combat Team fought some of the war's most intense street battles in the dense urban terrain of Baghdad's Eastern sectors and directed hundreds of millions of dollars at infrastructure improvements and equipping the Iraqi Security Forces. In March of 2005, the BCT redeployed back to Ft. Hood and began the task of preparing for reorganization into a modular Brigade Combat Team. Throughout 2006, the brigade reorganized to a Heavy Brigade Combat Team. The modular IRONHORSE Brigade Combat Team then deployed to Iraq in October of 2006 in support of Operation Iraqi Freedom 06-08. Taking over the largest and one of the most populated areas in Multi-National Division-Baghdad (MND-B), the IRONHORSE Brigade Combat Team was an integral part of the surge operation in Baghdad. The initial focus on combat operations provided a safe, stable, and secure environment which allowed reconciliation efforts of both Sunni and Shia tribal leaders and led to a significant expansion of Iraqi Security Forces, local government, and infrastructure improvement followed by a flourishing economic and cultural growth. The brigade redeployed from Iraq to Ft. Hood in January 2008 after an extended (over 12 months) tour. In February 2009, the IRONHORSE Brigade again answered the call to duty and deployed with 1st Cavalry Division to assume mission in the North-East corner of Baghdad. As the flagship brigade for the "First Team" division, the area of operations for the brigade included Sadr city, Rusafa, Adahmiyah and Istiqlaal, and was extended during the deployment to include Taji and Tarmiyah. The brigade had a significant role in the transfer of bases and responsibility to the Iraqis. In total, 9 facilities were transferred from US to Iraqi possession. The brigade partnered with Iraqi Security Forces including brigades of the 9th Iraqi Army Division as well as the 11th Iraqi Army Division throughout the deployment and was present for the historic 30 June 2009 transition when the Iraqi Security Forces took responsibility for security. It defended the Kumchon area north of Kaesong with the 27th Division.